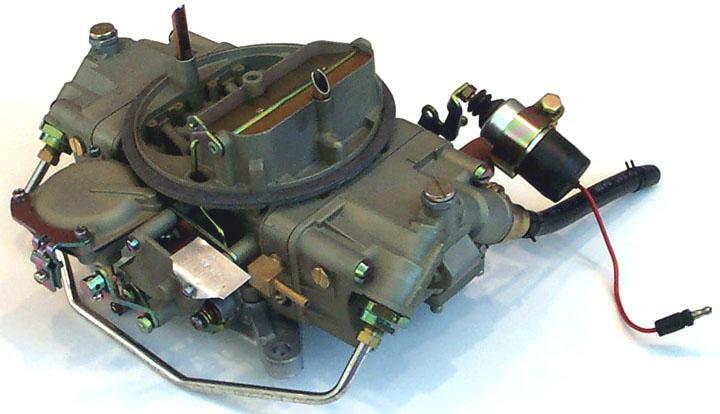 Ford carburetors are identified by basic part number 9510. 428 CJ and SCJ engines came equipped with a 4 venturi (4v) Holley 4150 carburetor rated at 735 cfm. Factory carbs used vacuum secondaries with dual metering blocks -- none of the original carbs that I'm aware of used mechanical secondaries. The Ford engineering number, Holley list number, and casting date code can be found on the air horn in front of the choke plate. Holley identification tags are mounted along the right (passenger) side of the carburetor on the choke assembly. Carburetors used during the 1968 model year were revised over time. See the 1968 carburetor identification page for more information. 1968 and 1969 carbs came equipped with an automatic choke. 1970 carbs came equipped with a manual, cable-operated choke. If you need a choke cable, the cable currently marketed as correct for 1970 Boss 302s is also correct for 1970 428s. 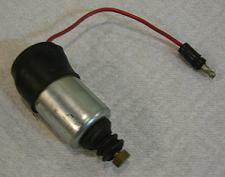 "On engine shut-down, a solenoid plunger closes the throttle plates in TWO steps. Instead of going directly from a high rpm to engine off, the plunger holds the plates open to a specified rpm while the solenoid is energized. When the ignition is turned off, the solenoid de-energizes, the plunger withdraws, and the throttle plates close further than if no solenoid were used. This more effectively shuts off the air/fuel mixture flow." The picture above shows a later service replacement electric solenoid (service part number D1AZ-9D856-C) on a 1970 carburetor. The D0OZ-A solenoid includes a blue wire, the D1AZ-C solenoid includes a red wire, and both are soldered to a terminal under a protective rubber boot. 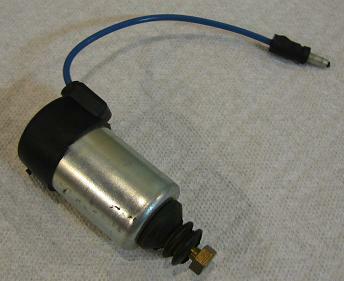 An earlier solenoid (service part number C8AZ-9D856-A) with a blue wire attached to a spade terminal was used on 1969 Boss 302s and 429s. Reproduction concours-correct blue wires are available for both the C8AZ-A and D0OZ-A solenoids. OEM air horn gaskets were dyed red. Note the plain brown gasket in the image shown earlier.. 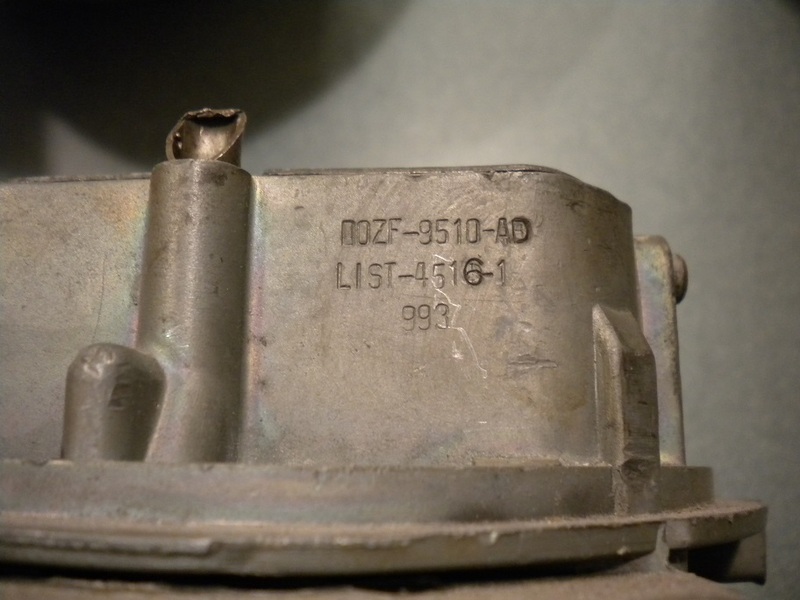 Date codes are found both on the carburetor air horn in front of the choke plate (noting the casting date) and on the carburetor tag (noting the assembly date). 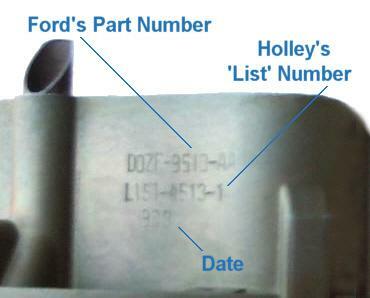 Holley carburetors used in a Ford factory application use either a three-character date code or a four-character date code depending on when the carburetor was produced. Holley used three-character date codes for the carburetors originally used on 428 CJs and SCJs. The four-character date codes began appearing on OEM and aftermarket carbs at some point in the 1970s. Three-digit date codes are typically of the form "YearMonthWeek", such as "974" for the fourth week of July, 1969. Month numbering starts with "1" for January through "0" for October, with "A" used for November and "B" used for December. I have also seen assembly tags using the letters "A" (for January) through "M" (for December, skipping "I" because it looks too much like a one), to represent month values, and the letters "A" (for week one) through "E" (for week five) to represent week values, yielding a date code such as "9GE" to represent the fifth week of July, 1969. It seems that the stamping machine operators weren't always consistent in the date code format they used! Reproduction carburetor tags are available from Marti Auto Works. 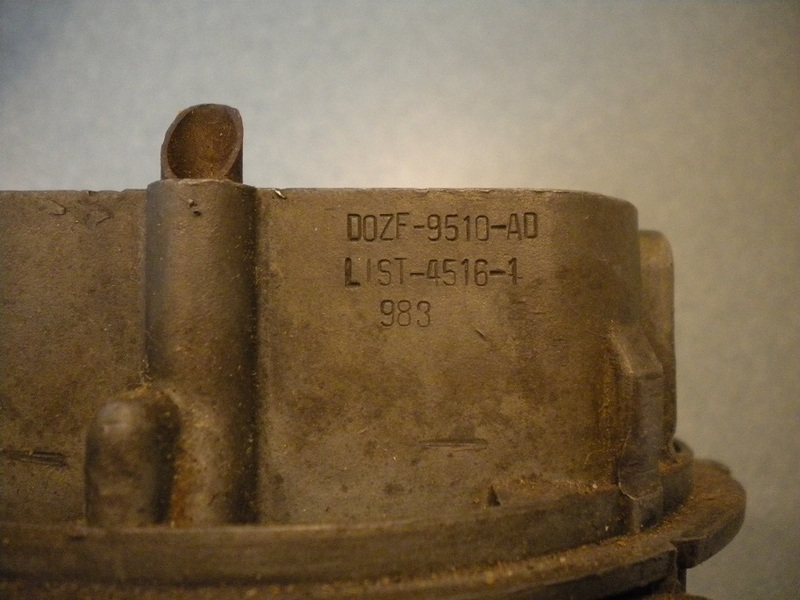 The air horn stamping shown above includes a Ford engineering number (D0ZF-9510-AA), the Holley list number (LIST-4513-1), and a three-digit date code (933). Tags are made of stamped aluminum that's rectangular at the bottom and triangular at the top. 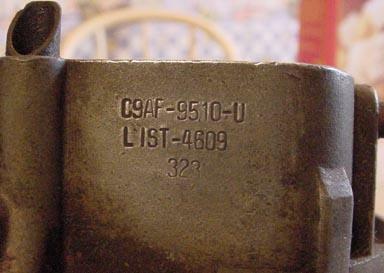 As in the example above, a tag should contain an AUTOLITE stamping, a Ford engineering number (D0ZF AC), a design change designation (B), and a date code (9GE). The tag above was bent slightly at the top after it was mounted, and I didn't want to risk breaking it by straightening it out. Aftermarket Holley carbs have four-digit date codes that use the first three digits to describe a day in the Julian calendar, with the last digit used to identify the year within a non-specific decade. For example, "1999" could represent the 199th day of 1969, 1979, or 1989. Thanks to Allen Cross who helped confirm several Holley part number differences between the various carburetors that helped with this research. It's worth noting that we've seen several examples of D0ZF-AB carbs with 993 and nearby date codes that were over-stamped to produce D0ZF-AD carbs with 4516-1 list numbers. We haven't discovered any documentation to explain why this was done. Interestingly, the aluminum Autolite tags on these carbs are not over-stamped. 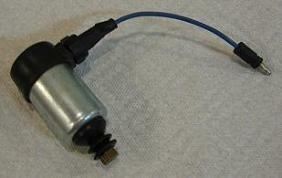 The only difference between the -AB non-a/c carb and the -AD a/c carb appears to be use of solenoid instead of a dashpot. Thanks to John Spencer for the pictures. All of these carburetors used the same primary and secondary metering blocks. Stamped identification numbers and part numbers are listed in the table below. A later universal service replacement carb often pops up in places like eBay where it's described as "correct" for 1969 and 1970 428 CJs and SCJs. This carb is easily identified by the engineering number stamped on the air horn, C9AF-9510-U (note the "U" for "universal") and Holley list number 4609. This carb was sold as a service replacement carb for 428 CJ and SCJ engines so it will definitely work, but it was never factory installed! Thanks to Craig Durkee for the picture.